Rajendra Prasad was born on 3rd December 1884 in Siwan in Bihar to Mahavira Sahai and Kamleshwari Devi. He is the youngest son of the Kayastha family. His father was a scholar of both the Persian and Sanskrit languages and his mother was a religious woman. When Rajendra Prasad was of five years old, his parents placed him under the tutelage of a Moulavi to teach him Hindi, Persian language and arithmetic. After the completion of the traditional elementary education, Rajendra Prasad went to the Chapra District School and at the age of 12 years, he was married to Rajavanshi Devi. Rajendra Prasad and his elder brother Mahendra Prasad went to study in T.K. Ghosh’s Academy in Patna for a period of two years. During that time he secured first in the entrance examination in the Calcutta University and was awarded Rs. 30 as a scholarship. Rajendra Prasad then joined the Presidency College in the year 1902 initially as a science student. He then passed his intermediate level classes under Calcutta University on March 1904. Later, he decided to focus on arts and did his Masters in Economics from Calcutta University in December 1907. He lived there with his brother in the Eden Hindu hostel. Rajendra Prasad was an active member of The Dawn Society. He was a devoted student as well as a public activist and it is was due to his sense of duty towards his family and education that he refused to join Servants of India Society. Rajendra Prasad was instrumental in the formation of the Bihari Students Conference in the year 1906. It was the first organization of its kind and produced some of the eminent leaders of Bihar like Anugrah Narayan Sinha and Krishna Singh. Rajendra Prasad served as a teacher in various educational institutions. He initially became a professor of English in Bhumihar Brahman College in Muzaffarpur in Bihar and then went on to become its principal. However, he left the college for his legal studies. In the year 1909, while pursuing his legal studies in Kolkata, he was also working as a professor of economics in Calcutta City College. In the year 1915, he appeared in the examination of law and passed it with a gold medal. He then completed his doctorate in law. In the year 1916, Rajendra Prasad joined the high court of Bihar and Orissa. He was appointed as one of the first members of the Senate and Syndicate of the Patna University in the year 1917. He also used to practice law in Bhagalpur. Rajendra Prasad also took active participation in the Indian independence movement. He formally joined the Indian National Congress in the year 1911. He met Mahatma Gandhi during the Lucknow session of the Indian National Congress held in the year 1916. During one of the fact funding missions in Champaran, Mahatma Gandhi asked him to come with his volunteers. He was then so greatly moved by the dedication, courage and conviction of Mahatma Gandhi that as soon as the motion of non cooperation was passed by Indian National Congress in the year 1920, Rajendra Prasad retired his lucrative career as a lawyer as well his duties in the university to aid in the movement. Rajendra Prasad also responded to the call by Gandhiji to boycott educational establishments by asking his son, Mrityunjaya Prasad to drop out of his studies from the western educational establishment and to enroll himself in the Bihar Vidyapeeth. During the course of the independent movement, Rajendra Prasad met Dr. Rahul Sankrityayan, who was a writer and a polymath. Rahul Sankrityayan was deeply influenced by Rajendra Prasad’s intellectual capabilities and looked upon him as a guru and a mentor. Rajendra Prasad also wrote articles for the revolutionary publications ‘Searchlight’ and ‘Desh’ and collected funds for these papers. He toured widely, explaining, lecturing and exhorting principles of the independence movement. Rajendra Prasad took an active role in helping the affected people during the 1914 floods which struck Bihar and Bengal. When an earthquake affected 15th January 1934, Prasad was in Jail. During that period, he passed on the relief work to his close colleague Anugrah Narayan Sinha. After his release two days later, he set up the Bihar Central Relief Committee on 17th January 1934 and took the task of raining funds to help the people himself. During the 31st May 1935 Quetta earthquake, when he was forbidden to leave the country on government’s order, he set up the Quetta Central Relief Committee in Sindh and Punjab under his president ship. 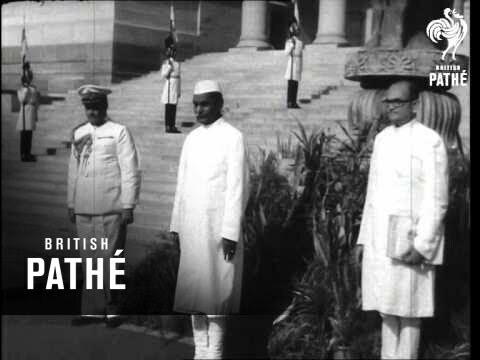 Rajendra Prasad was elected the president of the Indian National Congress during the Bombay session on October 1934. He became the president again when Netaji Subhas Chandra Bose resigned in the year 1939. On 8th August 1942, the Congress passed the Quit India resolution in Bombay which led to the arrest of many Indian leaders including Rajendra Prasad who was arrested from Sadaqat Ashram in Patna and sent to Bankipur jail. He remained there for three years and was later released on 15th June 1945. After the formation of the interim government of 12 nominated ministers under the leadership of Jawaharlal Nehru on 2nd September 1946, Rajendra Prasad got the food and agriculture department. Later, he was elected the president of the Constituent assembly on 11th December 1946. Thereafter on 17th November 1947, he became the Congress president for a third time after Jivatram Kripalani submitted resignation. Two and a half years after independence, on 26th January 1950, the constitution of independent India was ratified and Rajendra Prasad was elected the first president of India. In the year 1962, after serving twelve years as the President of India, he announced his decision to retire. After relinquishing the office of the President of India on May 1962, he returned to Patna on 14th May 1962 to stay in the campus of Bihar Vidyapeeth. Rajendra Prasad died on 28th February 1963. Rajendra Prasad was a prolific writer and his writings include 'Satyagraha at Champaran' (1922), 'India Divided' (1946), 'Atmakatha' (1946), 'Mahatma Gandhi and Bihar', Some Reminiscences (1949), 'Bapu ke Kadmon Mein' (1954) and 'Since Independence' (published in 1960). 'Atmakatha' is his autobiography written during his three year prison term in Bankipur Jail. Rajendra Prasad was awarded the Bharat Ratna, the nation’s highest civilian award in the year 1962.